Eugenie Bouchard and Simona Halep are set to face off in a Wimbledon semi final match. The match will start on Centre Court at 3:00 p.m. BST (10:00 a.m. EDT). BBC will broadcast the match in the United Kingdom and ESPN is airing the tournament in the United States. Live streaming will be available through BBC iPlayer and Watch ESPN as well as the ATP and TennisTV. The pair have only one head-to-head encounter at Indian Wells in 2014, a match that Halep won 6-2, 1-6, 6-4. Check out a video of the match, and an AP story below. LONDON (AP) — The women with the best records at Grand Slam tournaments this year, Eugenie Bouchard and Simona Halep, will meet for a place in the Wimbledon final. A key two-game turnaround in the first set helped Bouchard advance to her third consecutive Grand Slam semifinal by beating ninth-seeded Angelique Kerber 6-3, 6-4 on Wednesday. 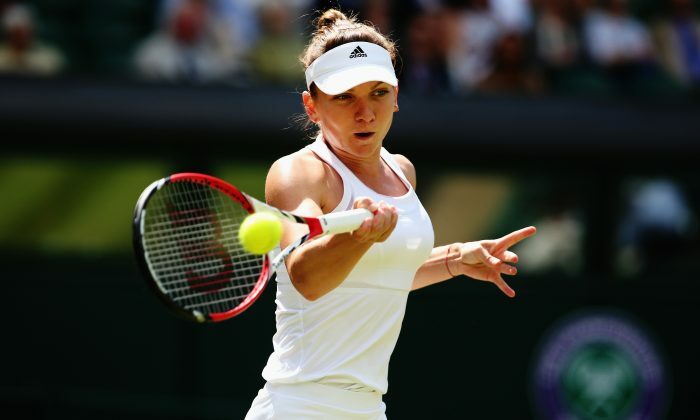 Halep won 11 consecutive games to complete a 6-4, 6-0 win over 2013 finalist Sabine Lisicki. The victories over their German opponents were no flukes. Bouchard and Halep have the best WTA records in majors this year — each with 15 wins in 17 matches. Bouchard, the 20-year-old Canadian, and Halep, the French Open runner-up from Romania, will meet in Thursday’s semifinals. The other semifinal is between 2011 champion Petra Kvitova and fellow Czech Lucie Safarova. Bouchard saved four break points at 3-3 in the seventh game of the opening set and then broke in the next game to take control against Kerber, who pulled off a three-set upset victory over Maria Sharapova on Tuesday. French Open finalist and third-seeded Halep was down 4-1 in the first set before winning the rest of the games. Bouchard, the first Canadian woman to reach the semifinals at Wimbledon, hasn’t dropped a set in five matches. She said she wasn’t treating the four break points she faced in that seventh game any differently — she played her usual aggressive game. Bouchard came into the match against the ninth-ranked Kerber with a losing record against top 10 players — 3-4 in 2014 and 5-11 in her career. But she made it two victories in a row over Kerber, having defeated her in the fourth round at the French Open. Bouchard’s quarterfinal win will move her into the top 10 of the rankings next week regardless of whether she gets past Halep to reach Saturday’s title match. Kvitova, who beat fellow Czech Barbora Zahlavova Strycova 6-1, 7-5 on Tuesday, is the only Grand Slam champion left in the women’s draw after Sharapova’s loss to Kerber. Safarova beat Ekaterina Makarova of Russia 6-3, 6-1, on Tuesday. Halep, meanwhile, is enjoying her 2014 hot streak. Kerber said it was tough coming back so soon after her tough three-set win Tuesday over Sharapova. Due to rain on Saturday, their fourth-round match was postponed from Monday to Tuesday, forcing Kerber to play two days in a row. Bouchard hopes to make her first Grand Slam final in only her sixth major, unaware of the effect she’s having back home in Canada.